[miau] A particular trend in slot machines right now is to include Asian themes. There could be many reasons for this including the fact that many Asian cultures place high importance on gambling. It is a big part of the culture in those countries, and slot machine developers want to create things that will appeal to people from that region of the world. 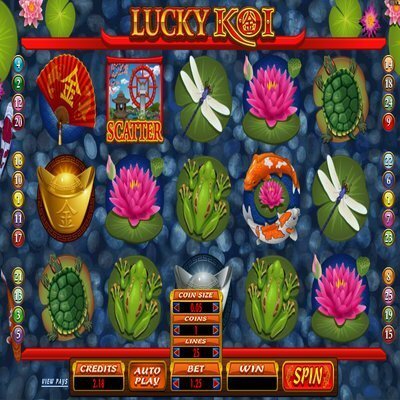 This game is a 25 payline game that has symbols such as dragonflies, frogs, and the like. All of the critters that one would find in a Koi pond are going to be featured in this particular game. It is something that adds to the theme of the whole thing. The game essentially plays out like most other slot machines. Players are trying to match up matching symbols on the paylines. When they do this, they are rewarded for various amounts. 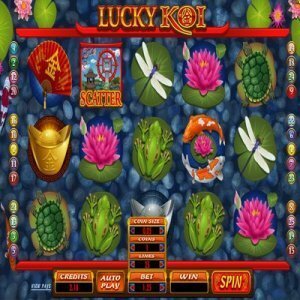 Players who are lucky enough to hit bonuses have the choice of getting free spins or going with the Lucky Koi feature. This gives them a little more flexibility and freedom to play out their bonus the way that they want to. It is something that is not seen in all types of slot machine games, but naturally it is one of the more popular features of this game. Everyone loves it when they are put in the driver’s seat, and this game provides that opportunity. The number of free spins that are awarded are done so at random. This could be anywhere from 10 free spins all the way up to 30. Those spins also come with a randomly assigned multiplier that is anywhere between 2 and 5. This can be the biggest money making factor in the whole game for a lot of players, and it is one of the more exciting parts of the whole game. This game has been said to be pretty generous with the bonus spins. They are awarded frequently as they are one of the more exciting aspects of the whole game according to a lot of people. Even those wagering small amounts of money may be lucky enough to catch some winners and have their winnings on the game climb quite rapidly. That is where the fun comes in. Players in this game can attribute the coin value to be anywhere from $0.01 all the way up to $2.50 per every coin. Of course, since there are 25 paylines, that means that the minimum bet per spin is $0.25. Players can typically afford that, and the players who want to wager a lot more are more than welcomed to do so as well. Be on the lookout for the bonus symbols to line up and consider taking some free spins as a reward for your play. Some may choose the lucky koi bonus from time to time as well simply to enjoy the change of pace.